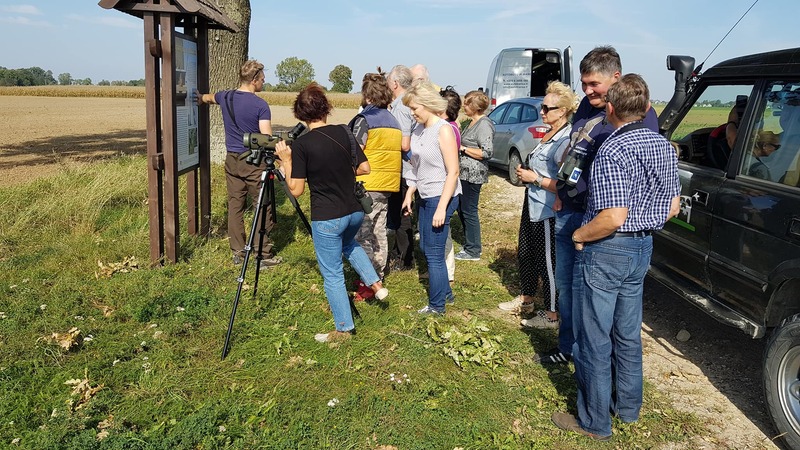 September 19, 2018, Lithuanian Ornithological Society organised a field trip South Lithuania and Žuvintas lake. Organisers of the trip presented to the participants results of the practical conservation actions performed in the frame of the jointly with the electricity transmission operator AB “Litgrid” implemented project “Installation of the bird protection measures on the high voltage electricity transmission grid in Lithuania” (No. LIFE13 BIO/LT/001303). At the field trip took part media representatives, as well as communication and public relations specialists, representatives from the Ministry of Energy and AB “Litgrid”. The main destination of the trip was Žuvintas Biosphere Reserve and its surrounding, where during the spring and autumn migration huge flocks of waterfowl are concentrated. During the autumn migration huge flocks of geese and cranes choose Žuvintas as roosting place. However, this site is potentially dangerous due to the high voltage electricity lines close to the Reserve. Seeking to decrease the birds’ mortality due to the electrocution, the LOD in cooperation with the AB “Litgrid” installed practical protection tools (various markers, which increase visibility of wires) at the most dangerous places around the country. In addition, 530 nesting boxes for kestrels were erected on the electricity pylons. It must be admitted, that numerous of the nesting boxes were occupied by the kestrels and 500 chicks were successfully raised in these artificial nests. During the field trip participants got possibility to see all practical protection measures, representatives of the LOD (Liutauras Raudonikis, Marius Karlonas, Eglė Pakštytė, Gediminas Petkus) and Director of the Reserve Arūnas Pranaitis introduced to the participants unique fauna of Žuvintas as well project activities implemented in the Žuvintas Biosphere Reserve.